Ovation Reflector Panels create superior acoustics in auditoriums, performance spaces and lecture halls. Designed for large spaces requiring improved sound directivity, strength, and timing of reflections from the ceiling area, this product is perfect for auditoriums, lecture halls, and performing arts centres. Standard panels are constructed of a 1/2" plywood core that is finished with a fiber reinforced gel coat, these curved panels are ceiling-suspended with attachment points on the steel framing. Select from a wide range of Suspended Ceiling Sound Directivity colors. 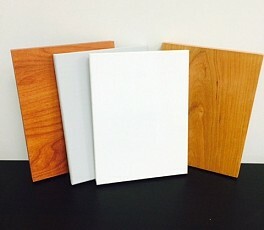 Laminate or hardwood veneer finishes are available on 3/4" plywood core. Ovation panels allow the designer to custom size large curved reflector surfaces. Typically 8' x 8' minimum sizes are recommended for broad band sound reflection. The sound reflector/diffuser is shipped as a flat panel and is bowed in the field to the architects’ or acoustical consultants’ specifications. The bowed surfaces produce more diffuse reflections and wider coverage. Panel radius and dimensions are variable to meet both acoustical and design requirements. The angle of reflection is adjusted in the field using turnbuckle and cable suspension.